Part Farecast (see below) and part Del.icio.us, Yapta lets you track airfare prices and share the information with others. See a flight you're interested in? 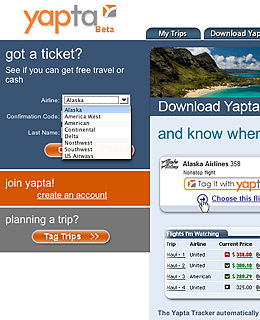 Bookmark it, and flight and fare data is stored in your Yapta account. If you find other options, you can bookmark those too, then go back and compare them all. Yapta will automatically update the store info if fares change; Yapta will also alert you if a fare dips even after you've already bought your ticket, so you can request a refund from the airline. Honorable mention goes to Airfarewatchdog.com, where fare researchers verify "lowest" listed prices and check if seats at that price are really available. Meanwhile, Farecast, the airfare shopping service and Time.com 2006 best-site pick, has added 20 markets to its service area; the site now provides airfare predictions (based on market trends) for 75 airports across the U.S., and has new search filters that let frequent fliers sort results by type of flight (red eye, short connection, etc.). The site reports an accuracy rate of 75%. If you're uncomfortable with those odds, you can buy a $10 insurance policy called Fare Guard that lets you lock in an advertised fare price. If Farecast predicts the fare will drop or stay the sameand it goes upthen Farecast will cover the difference.